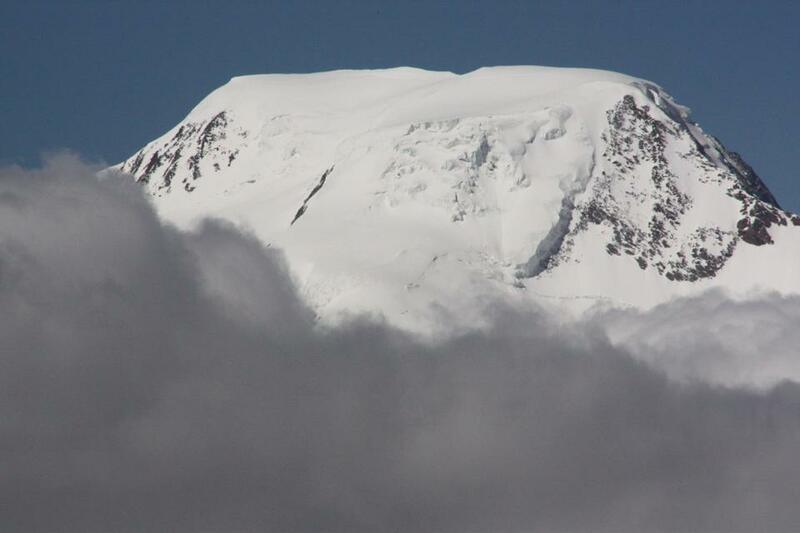 There are around 10,000 glaciers in the area around Whittier. All in all 29,000 square miles – 5% of the state of Alaska – are made up of glaciers. But with temperatures clearly on the rise, the ice is melting so fast that people here are talking of a boom in “climate change tourism”. – “See the glaciers before they’re gone”. Cynical? Bizzare? There is the old maxim that tourism destroys what it seeks. Climate change adds another factor. Some food for thought there. I talked to some of the young “climate ambassadors” about our own carbon footprint in doing this trip. The organisers are paying into a fund to offset the emissions from travel. And the idea is that these youngsters will be doing such a lot to spread the word about what we’re doing to the planet with global warming – and what we can still do to cope with the changes and halt the trend – that it will be more than worth the trip. And after spending 10 days with them, I’m sure that’s very true. The projects they’re working in at home – some full-time, some alongside other jobs – show a deep commitment to finding solutions. Our Swedish ambassador Jakob Rutqvist in particular keeps reminding me that it’s not just about spreading the word but finding creative ways to tackle the problem and move forward. He’s involved in a very high-powered network, supported by WWF, aimed at encouraging innovation across the globe when it comes to reducing emissions and halting global warming. Jakob is currently planning a trip to China in June to meet potential partners in finding solutions to energy and other problems in a country that is crucial to safeguarding the future because of its huge population. He’s also the Swedish youth representative at a big gathering in Stockholm next weekend to discuss climate issues. He’s invited Aart, the Dutch climate ambassador to go along. I’ve recruited them both to report on the conference for Deutsche Welle. This is a perfect story for our youth programme COOL. Anke and Laura, if you’re reading this, I think I’ve found you two new reporters. Jakob and Aart are both keen to disprove the popular assumption that – unlike the 1968 generation being celebrated in the media at the moment 40 years on – today’s youth are not interested in activism or committed to change. They want to make a statement to demonstrate the opposite. Aart told me he was really flabbergasted by our visit to the Begich Boggs glacier visitors centre.There’s a magnificent glass-walled viewing room. The trouble is that the Portage glacier has retreated so far that you can’t see it all from the centre. In less than 70 years, it has receded more than 2 miles. So there is an impressive view of Portage lake, iced over, and snowy hills, but definitely no glacier. What bothered me just as much was that I wasn’t allowed to interview our guide through the centre or record any of her talk. – Because it was about climate change. She wasn’t authorized to speak officially on that. Melting Ice is clearly a “hot” topic. The talk was informative, though, so thanks to our guide for that, even though she can’t be on the programme. The glaciers in this area bear the names of famous authors –Byron, Shakespeare and – Robert Burns. Friends of Scotland please take note. Rabbie is definitely on the retreat in this area of Alaska. I hope it only applies to the glaciers. Our guide Andy is very experienced in minimum-impact camping, and made sure we didn’t disturb nature too much and just had the basics – but the right gear for the conditions.Sleeping in the vicinity of glaciers is an odd experience. We had been prepared to sleep on thick snow, but our campsite was actually snow-free. Only the water was full of “ice cubes”. Our three glaciers were rumbling so much during the night I thought I was in a thunderstorm. You frequently hear explosive crashes, and a bit closer up the ice crackles and pops away constantly. The environment program you should be listening to every week. Podcast? 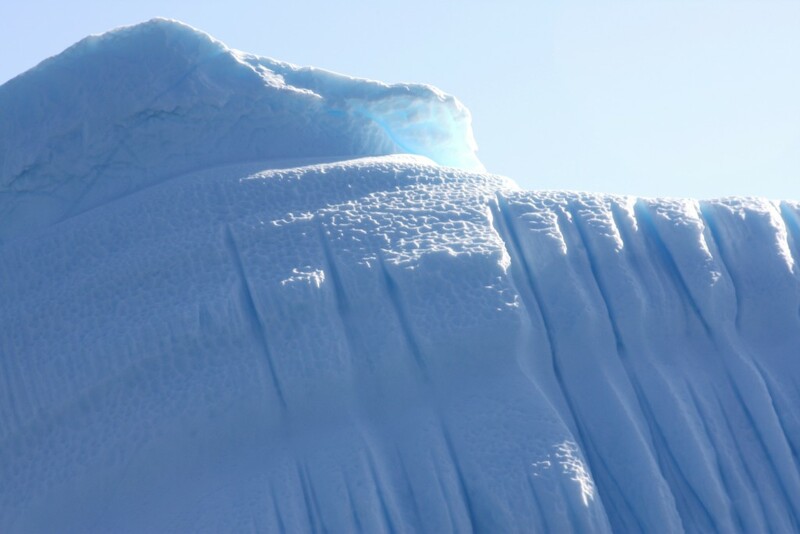 The ambassadors used the glacier background trip to film scenes for their “project movies”, linking their work at home to the dramatic ice melt in this very sensitive region. Ines from Spain braved the icy temperatures in her bikini and a rubber dingy. The first half of her film had been shot in an empty outdoor pool at home, demonstrating the drought conditions which are causing desperate water shortages in Portugal. Her idea was to show that you might have to go a very long way to get water. Unfortunately our trip was flawed when our expedition leader Marc Cornelissen – the mastermind behind the “Climate Change College” – got a message by satellite phone that his father was critically ill. Visibility was too poor for a helicopter to collect him, so Andy took him off in the “Zodiac” boat to meet another boat coming in from Whittier to take him back. This was very sad for all the group, as the field trip and Marc’s whole project was just coming to its highpoint. They all coped very well, including taking over the logistics of getting the group and all their equipment organised for the trip home afterwards.We hope things will work out OK for Marc. Marc told his ambassadors as he left they had to see the project through. So the kayak trip went ahead. We paddled through a field of mini ice-bergs. Now I know what it feels to be a slice of lemon in a glass of fizzy drink with ice cubes in it. I recorded as we went along – and even interviewed Marie Laure from kayak to kayak as we reached our destination – as close as safety would allow to the 3 glaciers. She’s in love with snow and ice, but concerned that people looking to enjoy it on the ski slopes of Europe use up too many of our natural resources, with artificial snow and a huge amount of water in general. Her project is to save on water consumption in the ski resorts of her home in France by simple things like water-saving showerheads. She told me about it and her deep concern about global warming as we sat and marvelled at the glaciers – and the sound of them melting and breaking in the background. That would be a good place to end this entry of the “Ice Blog”. The Climate College Field Trip has come to an end. But of course climate change is a never-ending story. Back in Bonn, Germany, we’re in a heat wave, with high summer temperatures, and it’s only early May. (The mosquitos were already out in Fairbanks, by the way, way too early, the locals said). I heard on the radio that the oil supply will “peak” as early as in 10 years. And the IPCC climate chief says the sea level increase through global warming definitely exacerbated the effects of the disastrous cyclone in Myanmar. 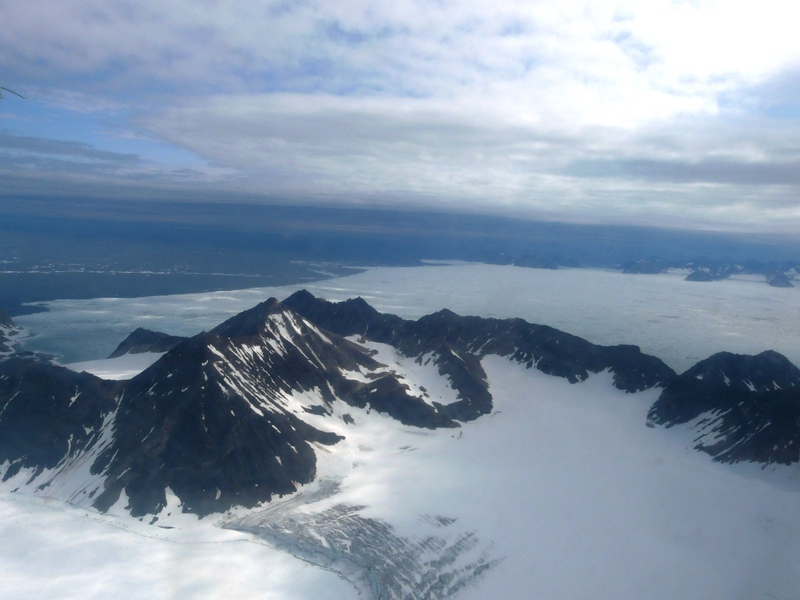 Watch this space for more Arctic pictures and climate news and views in the weeks to come. writing this in Whittier, a port south of Anchorage surrounded by three glaciers. The glaciers have retreated considerably in recent years, and we’re going out to have a look tomorrow. The ambassadors had their first quick look at a glacier from a distance tonight. We drove here from Healy in a biodiesel bus, driven by Andy, who’s going to be our guide tomorrow. We stopped in Anchorage to meet Zane, the guy who makes the biodiesel from recycled cooking oil.We have reported on similar ventures in Germany on Living Planet. It was interesting to hear about the situation of renewable energy sources in Alaska at a briefing in Anchorage. At the moment, renewables only account for one percent of energy production. I think that’s far too low, but given that this state provides about a quarter of the USA’s oil output, people say it’s a good start. Felipe, our Portuguese climate ambassador, was impressed and made contact to Zane with a view to meeting up again and exchanging info. Erika (with the compost project) used the opportunity to introduce Alaska to “Wormy” and campaign for composting with worms. Art, who’s working on turning businesses carbon-neutral, lent some active support. Marie Laure, our French ambassador, was the one with the wet feet today. I found out she’s a sheperdess at home, so that’s probably why she was unphased by this. Ice-capades and Alaska Baking with Methane? This will be a picture day to more than make up for the last couple of text-rich entries.Cara has helped me solve the picture problem and the laptop has not been playing up so far. We’re now in Healy, on the borders of the Denali National Park. We’ve left the freezing temperatures of the Arctic, but are still in snow and ice country. We spent an incredible day in the (ice)-field with Katey Walter and her assistant Laura, scientists from the University of Alaska in Fairbanks. 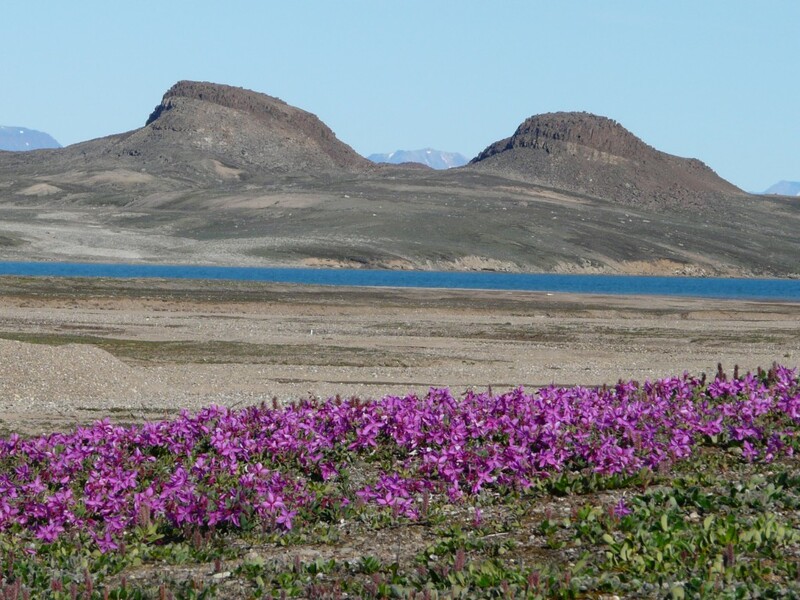 They’re studying methane emissions from melting permafrost lakes and their contribution to climate change. Methane is a greenhouse gas 23 times more powerful than co2. Climate change models need to be adjusted to include it. As global temperatures increase, ponds and lakes are formed as the permafrost thaws. There’s been a considerable increase in methane measured seasonally in high northern latitudes, and Katey is looking into the background. 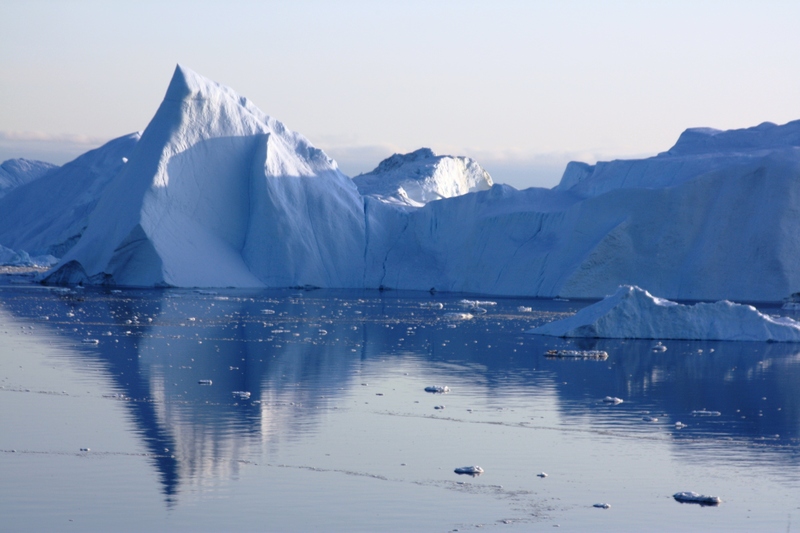 How is it formed, to what extent, how much is released under what conditions and what does it all mean for the future climate? We drove to 8-Mile lake, the dirt track rough but mostly cleared of snow. We were on the lookout for moose and bears, but they kept a low profile.We did find bear tracks on the ice, though. 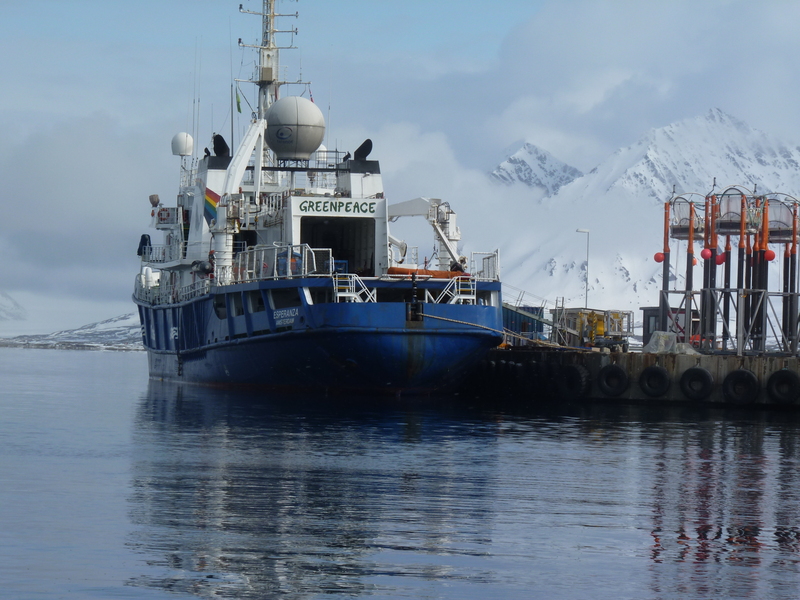 Transported power drills and other equipment for collecting samples. 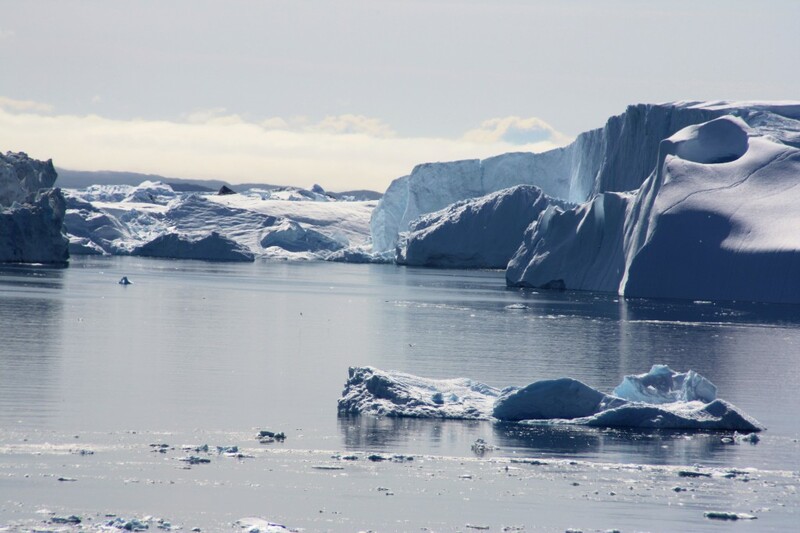 The idea is to collect plant matter from under the ice and on the tundra to check in the lab, and to collect some methane being emitted from the lake. 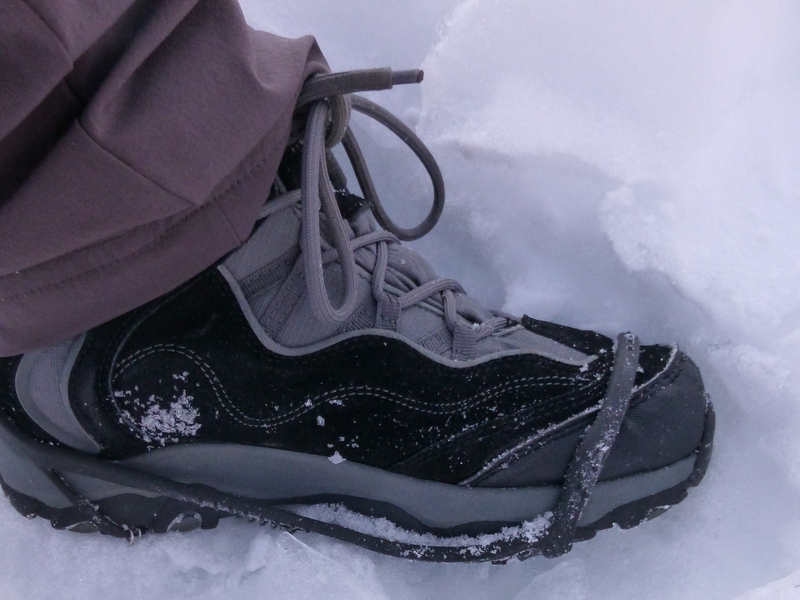 One hazard moving around from ice to tundra is losing your boot in snow up to your thighs if you land on a deep soft bit (happened frequently). Sometimes somebody has to dig it out. The lake is still frozen solid, although the top layer gets mushy or fluid in the sun, so we were wading through water at times. Strange feeling, have to rely on Katey’s word that the ice will hold us all with no problems. Set up equipment on tarpaulin on ice and have a picnic lunch. One team of CC ambassadors helped Katey drill into the ice to get plant samples for analysis. The other went with Laura onto the (melting) permafrost to collect samples of dead leaves for analysis (all to find out how fast and under what conditions their decay produces methane). The students (well they’re not really students, but they do belong to a “College”) worked really hard and without whinging, out on the ice a whole day in strong sunshine. I’m impressed by their knowledge of climate issues, the questions they ask, and how well they soak up the knowledge and can present it. I’ve been interviewing them intermittently (to be heard on Living Planet in the weeks to come). Laura found a methane “hotspot” in a little “puddle-pond”. She put an umbrella trap over it, a plastic umbrella/funnel with plastic bottles attached, which collects the gas. Then she found a second hole which required a boat to access. Art hiked back to base camp, brought and inflated the dingy and they put out a 2nd trap. Katey and Laura are great, amazingly dedicated and very patient with visiting journalists and “trainee” scientists. Marc Cornelissen, our expedition leader is a bundle of energy, enthusiasm and he’s completely unflappable. He can magic up lithium batteries which last longer in the cold, fix laptops, cameras, ice-drills, rescue lost equipment stuck in the ice and provide extra socks and even boots after those little “icecapades”.And he just keeps going non-stop. You can actually light the methane we collected from the lake. Scientists are working on trying to capture it to use it for fuel. Katey says that would be really good for the environment and the climate. George Divoky is a man with a mission. For three months every summer for more than 30 years, he’s been keeping an eye on a breeding colony of guillemots on remote and normally uninhabited (at least by humans) Cooper Island, north-east of Barrow. He counts them and weighs them when they come in to nest, as attentive as any parent bird. But they’re dependent on sea ice for the feed that’s underneath, and the population is declining, because of the changes in sea ice patterns (I described in earlier entry). They’re forced to eat sub-standard food, as polar cod numbers are dwindling. He’s noted puffins, a sub-Arctic species not normally at home in this region, moving in. But chicks on Cooper are welcome prey for marauding polar bears, also struggling for food with the warming trend causing a decline in sea ice. The bears have even had a go at George’s tiny cabin, and all the plastic bottles inside it. Seems they like hot chilli sauce, not so keen on shampoo. He wanted to fly over with a search and rescue flight plane today, to check if the cabin’s been disturbed, but it was too windy. You can listen in to an excerpt from the interview I did with George on this blog soon and the full version in Living Planet in the weeks to come. George is an inspiring and charismatic speaker. He made quite an impression on all of us. You can also have a listen to Cara, one of our climate ambassadors, giving me her reactions to George’s talk on our windy trek back through the snow, once I get the audio version uploaded (details below). Cara’s a very lively climate ambassador and asks a lot of questions I would otherwise ask myself. If she changes her mind about the eco-renovation project, she could be a reporter at DW. Other than that, the CC students have been busy with their usual daily chores, listening, questioning, blogging, filming, interviewing climate witnesses and being interviewed. This is attracting a lot of media interest, but they’re also very professional themselves when it comes to documenting the climate change info they’re gathering, and passing it on. Erika put in an appearance in her pink fluffy worm outfit, very fetching. (She’s the one with the compost project). Jakob offered some tips with my laptop problem. He’s a real tech expert. I’ve been having a(nother?) bad technology day, with the laptop crashing. So excuse me if this entry is a bit thin on the pictures, I’ll make up for it later. A loss of data was averted by Dorin, a super-friendly IT expert from BASC. He fled from the old Roumania when he was 17 and has ended up in Barrow. (There is a strong multicultural element here, at the top end of the world. Our Eskimo friend Alice told me today she also has some Portuguese blood in her). People are very welcoming and helpful here. Basc has looked after us very well. Thanks to Alice, Dorin, Basc chief Glenn and all the folk we met in Barrow. There was beautiful sun today (you could see the little ice crystals glittering in the air), so there was a lot of outdoor filming. Pieter, the CC cameraman from the Netherlands, deserves a medal, he was outside with the camera for hours. This afternoon we watched the met man launch the weather balloon in Barrow, contributing to world data on weather and climate. And on the way home, our driver Michael Donovan (yesterday’s bear guide) let us have a photo stop on the “beach” – well the frozen over Chukchi Sea. An unbelievable landscape, “waves” of snow stretching as far as the eye could see. I’m writing this on the plane to Fairfax. There’s an amazing view of snow-covered Arctic Alaska, the peaks tinged pink and gold in the nighttime sun. It looks deceptively beautiful. We’ve experienced the harsh realities of life in a pola region. The snow cover is diminishing as we move south. We’re a couple of hours late, so it’ll be nearly midnight by the time we get in. And we’re off to Healy at the crack of dawn. Climate ambassadors have a punishing schedule, and this accompanying reporter has to keep up with the pace. Life can be tough when you’re travelling with celebrities. “When we go out today,we have to stay together. And if the bear guides say back to the skidoos, you get back NOW.This is polar bear country.” Anne Jensen is an archaeologist of the charismatic – and extremely hardy sort. 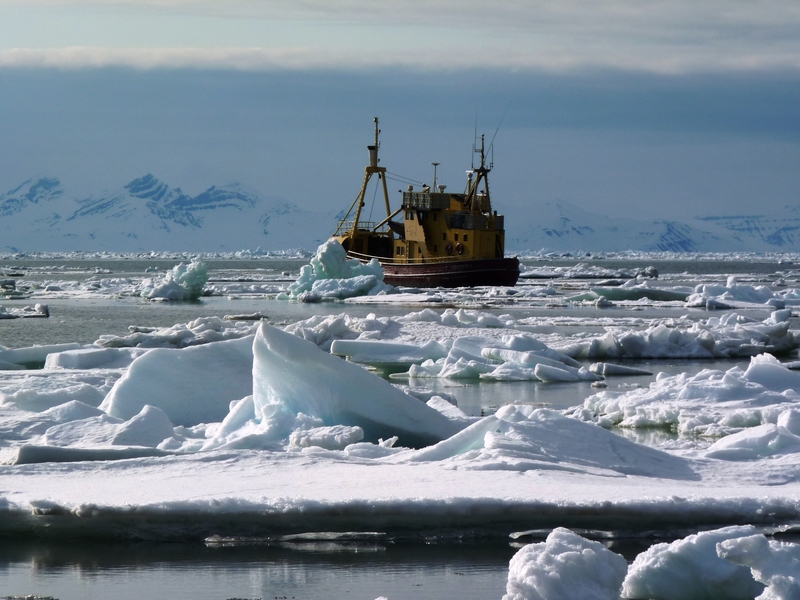 To conduct excavations in the Arctic, you’d have to be. She had held us all entranced in the disused theatre now used as a storeroom by BASC, telling us all about the history of the region and her efforts to preserve old indigenous grave sites and remove remains for reburial before coastal erosion washes them into the water. We’d heard from Chris yesterday how the retreat of the sea ice leaves the coastline more vulnerable to storms and pressure from wild ocean waves.Today Anne took us on an excursion to Point Barrow, the northernmost point in the USA,to visit one of the sites. We weren’t going to be able to see much. The locals told me this was the worst kind of day for a trip out. Our expedition leader Marc Cornelissen rounded up his charges before we settled onto the snow machines and sledges.”Has everybody got FULL Arctic gear? I don’t want to hear anybody has forgotten a pack, their gloves or anything else. This will be a long ride, the strong wind in our faces on the way out and you need to make sure you don’t get cold”. 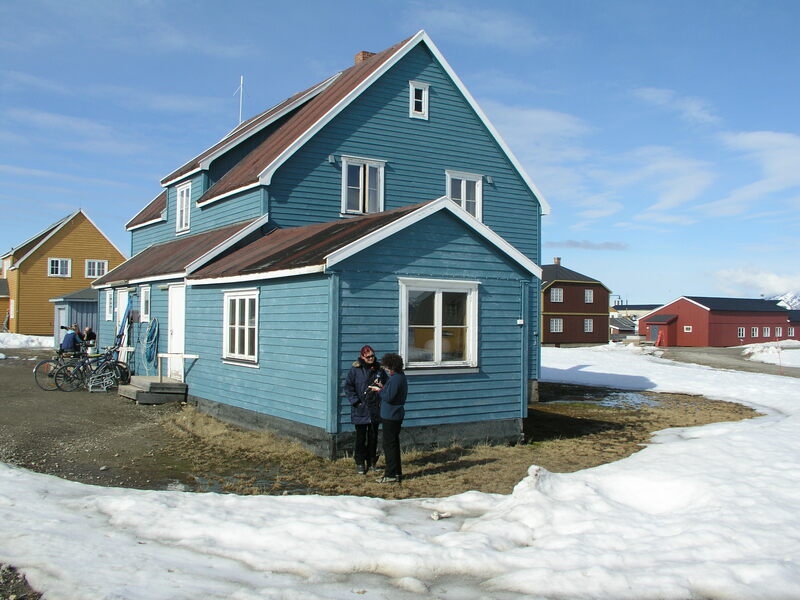 It was an amazing trip, a tiny taste of the life of an Arctic explorer. 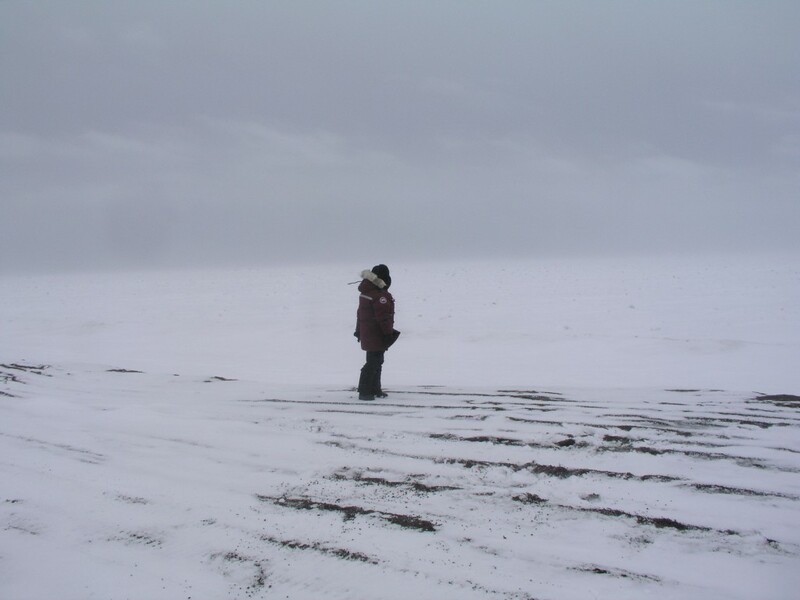 Sitting on the flat wooden sledge,the wind and the exhaust from the skidoo blew the snow into our faces and everywhere else.At times I couldn’t tell where the sky ended and the snow began. And when we reached the point where the two seas meet – all we could see was snow-covered ice, all around.